« Introducing the User Pages: Create your own content! 1 – providing fans with a venue to share their many contributions to the game with the thousands of players that visit our web site every day. The User Pages should now fix this and we look forward to your feedback on how to continuously improve them to make them the place of choice to post and share your contributions. 2 – beginning to put in place the tools we’ll need to run our Organized Play programs, later this summer. Memoir’44 Organized Play programs will be team based, centered around quarterly events in Overlord and Breakthrough format and make good use of your User Pages. 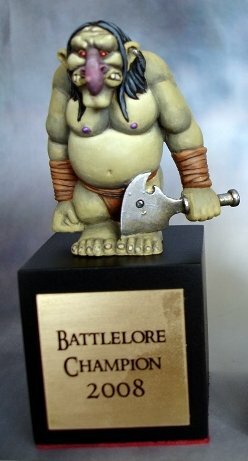 The BattleLore Organized play program will be more focused on living Epic Adventures rather than encouraging outright competition, but should prove equally fun and be the venue where a certain Troll makes its first official appearance. 3 – last, but not least, the User Pages will pave the way for the Computer version of Memoir ’44. The next tangible proof of progress will be the release of complete, from-the-ground-up rewrites of the scenario editors for both Memoir ’44 and BattleLore, later this summer. This entry was posted on Friday, May 16th, 2008 at 17:29 and is filed under BattleLore, Games, Memoir'44, News. You can follow any responses to this entry through the RSS 2.0 feed. Both comments and pings are currently closed. I am hoping by a troll “appearance” you mean in the scenarios. I will be greatly dissappointed if this is yet another “exclusive promotion” where I need to go somewhere to get a copy of it. But other than that, the news looks good! The troll will NOT be an exclusive promotion. it will be widely available, no worry. News … Any News …. ???? Thanks Eric, now keep this moment going! Don’t spill the beans in one go and keep feeding us. Computer version of Memoir ‘44 ? It will be something along the lines of the online Ticket to Ride-game or a stand-alone normal PC game?